Yellow pimpernel, Lysimachia nemora, is a small hairless plant, with leaves of a similar shape and size to those of Common Chickweed, Stellaria media. 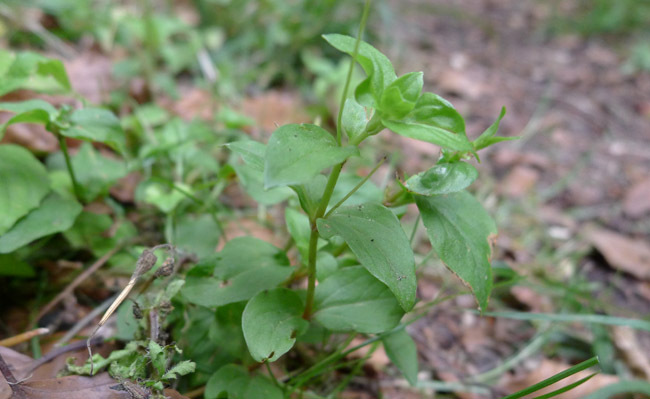 Common Chickweed is an edible wild green that I have written about in a previous article. Chickweed is easily recognised when its small white flowers are present, less so when they are not. 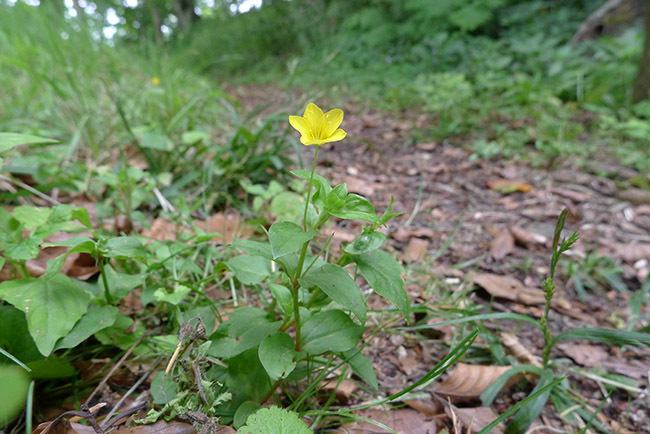 Yellow Pimpernel is an inedible/mildly toxic plant that can be mistaken for Chickweed. Again, when Yellow Pimpernel’s pretty yellow flowers are present, the plant is relatively easy to recognise (and differentiate from Chickweed). When neither plant’s flowers are present, however, then we need to look for other differentiators. The leaves of Yellow Pimpernel, Lysimachia nemorum, are very reminiscent of Common Chickweed, Stellaria media. Photo: Paul Kirtley. When neither Chickweed nor Yellow Pimpernel is in flower, the key differentiating feature we need to note is that while Yellow Pimpernel is hairless, Common Chickweed has a single line of hairs on its stem. Yellow Pimpernel, Lysimachia nemorum, has a hairless stem. Photo: Paul Kirtley. 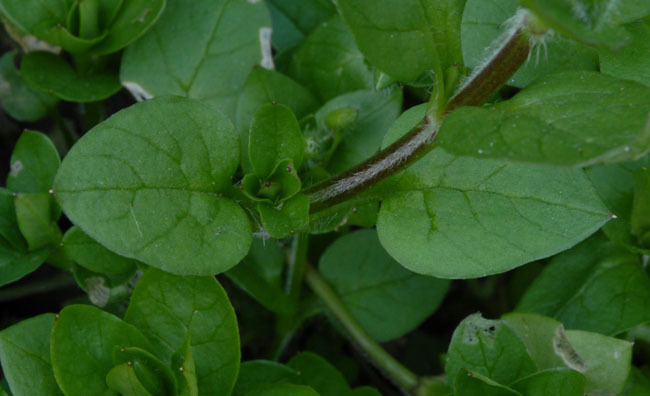 Common Chickweed, Stellaria media, has a clearly visible line of hairs on its stem. Photo: Paul Kirtley. As long as you stick to this key differentiating feature of a line of hairs on the stem to positively identify Common Chickweed, then you will avoid Yellow Pimpernel. 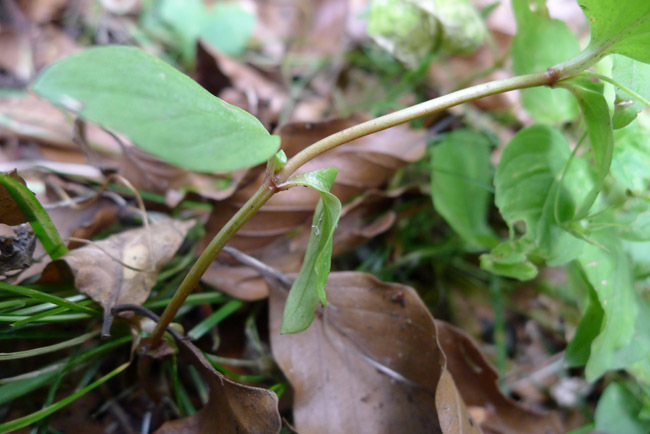 Please read the BSBI’s Code of Conduct for the Conservation and Enjoyment of Wild Plants for guidance on the best practice (and UK laws) relating to foraging for wild plant foods. Brilliant, simple and clear, cheers matey! Where possible, simple and clear is what I aim for. Excellent article, the dandelion, being an endive similar I guess to chickory is a very useful plant. All parts are edible and this one goes against the survivalists’ grain to avoid plants with a white sap. Flowers tart up a salad, the roots can be boiled and even used to make coffee. Careful where you source them tho. Dog’s aren’t fussy and apparently the taste is as strong as the smell!